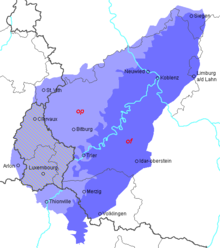 Alsatian is a Low Alemannic German dialect spoken in most of Alsace, a formerly disputed region in eastern France that has passed between French and German control five times since 1681. A dialect of Alsatian German is spoken in the United States by the so-called Swiss Amish, whose ancestors emigrated there in the middle of the 19th century. The approximately 7,000 speakers are located mainly in Allen County, Indiana, with "daughter settlements" elsewhere. 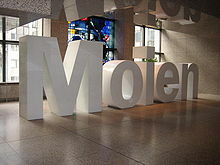 Ripuarian (Ripuarisch), spoken in North Rhine-Westphalia and German-speaking Belgium and a small edge in the south of the Dutch province of Limbourg. German dialects are dialects or often considered languages in their own right and are classified under the umbrella term of "German". Though varied by region, those of the southern half of Germany beneath the Ben Rather line are dominated by the geographical spread of the High German consonant shift, and the dialect continua that connect German to the neighbouring varieties of Low Franconian (Dutch) and Frisian.